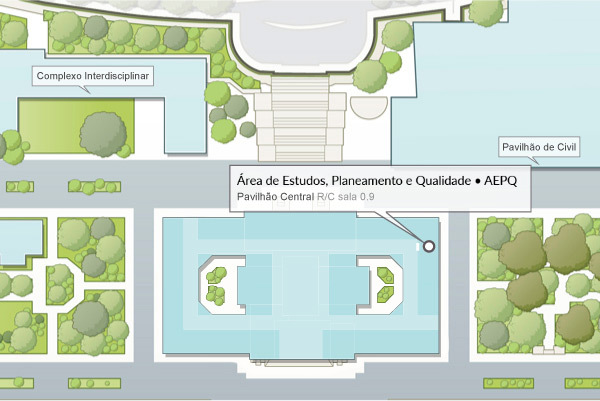 The Institutional Studies, Planning and Quality Area (AEPQ), originally known as Studies and Planning Office (GEP), was constituted by decision of the former Executive Board on 25 June 1993, following the need of the main bodies, in particular a body that provided assistance in such specific areas that contributed to the strategic management and development of Tecnico Lisboa, given the growing need to create information processing structures, which made the decision-making process easier. More than an office, the AEPQ has sought to work as a research team under the scope of the higher education management and assessment activities, by carrying out final-year projects and post-graduate programmes in areas of interest to the School. In this context, the AEPQ has been a structure of creation of study and reflection in Tecnico Lisboa and its immediate environment, by responding to the demands of the Executive Board, the Pedagogical Council, within its areas of action and that included, firstly, four priority areas: the administrative and financial area, the pedagogical area, the science and technology area and the vocational training area. Over the years, these areas have developed in such a way that they split up from the AEPQ as such. Vocational Training was the first area to have its proper space, which received significant support by the European Community and the Portuguese State. Initially, it integrated disperse training actions at Tecnico Lisboa, in a well-defined plan and with clear objectives, with a view to optimizing the school’s resources, whose coordination, construction and implementation was the AEPQ’s responsibility. Subsequently, it was integrated in other Tecnico Lisboa’s services, namely at the Post-Graduate School Support Office (GAEP) and the Staff Training Unit (NFP), which is currently operating under the scope of the Postgraduation and Continuous Training Unit (NPGFC). Then, the Financial and Administrative area evolved in such a way that it had to move to new premises. The legislation passed at that time, made Tecnico Lisboa comply with the Official Accounting Plan (POC) and, therefore, it was found necessary, on a first stage, that the AEPQ would be staffed with highly competent technicians in the economic and financial area, in order to ensure accuracy of the accounting procedures on a par with the optimization of the of the financial resources of Tecnico Lisboa. At present, this activity is concentrated in one Financial Division, supported by 3 specific areas: Accounting, Budget and Property and Projects. In turn, the area of Pedagogical Evaluation, was needed its own premises. The law of autonomy and the exponential development of higher education, led to the creation of mechanisms to evaluate universities and their programmes, in order to ensure quality patterns. On the other hand, when Portugal joined the EEC and, as a consequence, opened up its labour market, there was the need to establish quality patterns to standardize academic degrees awarded by the university systems at European level. In this context, it appeared necessary that the AEPQ would participate in the first pilot experiences within the evaluation and accreditation of the undergraduate programmes, by following up in the next years all processes in this context. In addition, the motto “évaluer pour évoluer” conveys the spirit underlying the action of the AEPQ in the pedagogical area. On the other hand, the Pedagogical Evaluation area took up some of the collaborators of the Studies and Strategy area in 1999, given the fact that the pedagogical issues had become wider in scope among the concerns of the new Board of Directors and, therefore, the service was reshaped in order for both teams to develop their studies and projects in the same area and, finally, in May 2000 they moved to new premises and, from this time onwards, coordinated by only one person. Within the reshaping of the central services of Tecnico Lisboa, and after 14 years operating in the basement of the Main Building, the working conditions of the AEPQ team were significantly improved, as it moved to the upper floor of the same building in 2007. Further encouraged to pursue its mission, the AEPQ left an open space to new premises with 2 floors, with seven offices and a meting room, which ensure working conditions significantly improved. Again in the light the reshaping of services, and in October 2007, the AEPQ was restructured with the purpose of reinforcing and motivating its team, by investing in the statistics and prospective component. In this context, a specific unit was created – the Statistics and Prospective Unit (NEP) – whose tasks should significantly contribute to create and maintain collection, processing update, and dissemination structures in order to allow for achieving the goals of the service, which, in turn, intends to contribute to the strategic objectives of Tecnico Lisboa.